Jim Rickards is a different case than the usual PM analysts as he usually doesn't make the same kind of date-specific predictions on PMs that most have (although he has made some - we will get to later). His impressive credentials, that we won't mentions here, can carry some weight and he tends to know his topic extremely well in interviews. But, we find, he does ride-the-fence in order to attract both a more sophisticated investor as well as appeal to the run-in-mill PMBug's avarice. The major point to consider - Jim is an author and is selling books. I think he may also give seminars but most of the interviews he does from CNBC to the garage doomsday-er (via Skype) are promoting his, now 3, books. He does seem to have a less-advertised package program for 'stock-picking' that I find extremely distasteful. I've read his first two books - Currency Wars: The Making of the Next Global Crisis and The Death of Money: The Coming Collapse of the International Monetary System. His third is out this month (April 2016) and is titled: The New Case for Gold. It arrived for me the other day, but I have not read it yet. He is better known than the usual PM analyst and exports a deeper-understood argument than these contemporaries that we usually focus on. It's been a while since I read the two books so I hope I am not mischaracterizing its contents or his message(s). While Rickards softens the apocalyptic tone of most of the hyper-driven PM pundits, he still uses their sensational, potential, future pricing to appease their fantasies of enormous wealth. He states that, big changes are due in the world's financial system(s), but that these have, historically, happened previously and we all survived despite the potentially radical adjustments. While I would lean to him being correct - the problem is that we don't know the potential of the 'next' collapse. As he admits, we are definitely in uncharted waters when it comes to the current International Monetary System. There is no historical precedent for our debt or the stop-gap solutions of such that have run on for years but are completely unsustainable. Putting it colloquially - 'we are in a pickle'. 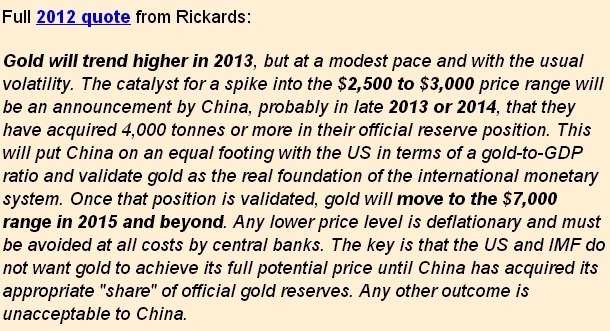 Rickards prophesizes a potential $10,000 /oz price of Gold. But without a Freegold-envisioned collapse of the paper market - this price seems impossible unless we are living through some form of Hyperinflation. As FoFoA has shown us - commodities rise and fall together - and while we firmly believe physical Gold is not a commodity (almost total lack of use in Industry) - its price is established in the paper market - in-which it is traded akin to a commodity. So, in an environment of severe inflation Gold might represent nominal gains, as the DOW and toilet paper will also rise (he states similar but plays it down). Like some of the PM analysts, it seems the $10,000 figure is a bit of a red-herring to procure further interest in his theories. Perhaps, despite the seemingly lofty price, he only recommends owning 10% of gold for this very reason. Since $10,000 is actually too small to infer the collapse of the paper market - he is really only making the case for gold to 'established investors' who have always judged it to be unpleasing as it offers no-yield. So while un-thinking 'Bugs' appreciate the highness of the number (we see this as an underlying goal for book sales), his main focus is the mainstream investor who has no similar insurance-outlet for a more extensive collapse. So what is he saying? He exports an understanding of the yellow metal (why Central Banks hold it etc.) of which there is little bona-fide details in Wall Street circles - and he exports some data-supported apprehension, and the fragility, of the modern financial system - presuming a notable forthcoming change. Okay. A further point I don't quite follow; he endorses physical ownership but never really expands upon the reasons why (to my satisfaction, anyway). I, personally, 100% agree with the sentiment (physical over paper) but I know my reasons. If he doesn't trust the paper-system to prevail and survive through the shift he prophecies then he must realize a significantly higher gold price. So he kind of wants it both ways. How does a slow rise to $10,000 ineffectual-ize the paper market that he rejects to investors? Part of this may be that he does testify about treading carefully when discussing the 'gold space' as it's very easy to be labeled a 'nut' by part of the, more mainstream, audience he is courting for potential sales. It's not dissimilar to predicting a huge price increase in gold but only recommending investors have a maximum of 10% in their portfolios. Unless, of course, he doesn't have the courage of that prediction or he is appeasing to attract a 'book purchasing' audience making him disingenuous, in my opinion. So, by not addressing free-floating gold-demonetization - Jim Rickards is essentially denying it.... or purposely dissimulating it. The trouble is that the eventual forces won't dictate further procrastination - despite a behavioral economics Tsunami of gimmicks and propaganda. 'You can deny reality, but you can't deny the consequences of denying reality.' I think I would be more surprised if he did endorse a 'Freegold' solution - obviously he has been given inside information and it isn't something 'they' (whoever 'they' are) might want promoted to the general populace. It's possible he understands it but his success may be directly linked to avoiding advocating or acknowledging its existence. We don't know any of this but I feel it's a reasonable assumption on my part. Below is a 5-year old prediction by Rickards... I had seen others, before his books, but they don't appear available any longer on YouTube. From memory one was a major Network (like a CNBC) call that we would have $3000 Gold in 2 years - it may have been from 2010. Anyway, he isn't totally immune from date-specific gold price calls.